A properly functioning A/C unit can create a refreshing atmosphere in your home despite the rising heat outside. 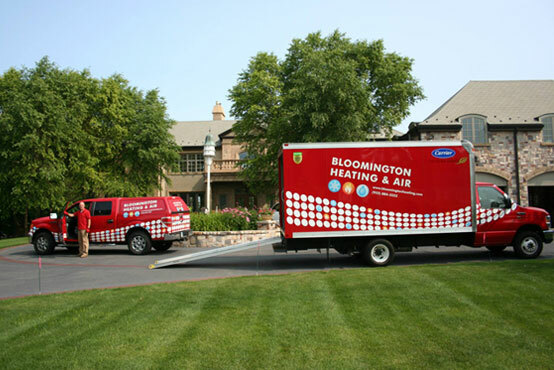 Bloomington Heating & Air has provided Minnesota residents will the full scope of HVAC services for over 25 years, including air conditioning installation, repair, and maintenance. We understand how dangerous high levels of heat can be for pets, children, and elderly adults in your home. That’s why our AC repair company strives to provide the most reliable and prompt services to repair or replace your A/C unit with the least amount of inconvenience to you and your family. From fast HVAC repair to expert cooling system installation services, we have you covered! Air conditioning units are the most effective solution for cooling your home and promoting adequate air circulation. But even with proper care, regular use of any cooling system can cause wear-and-tear to the unit. A small problem can often grow and affect an entire unit if it is not addressed early, leading to larger, more costly repairs in the future. Our trained technicians are prepared to diagnose any issue and can make the necessary repairs to restore cool comfort in your home. Not only does timely AC repair keep the indoor air cool, it also increases the functional lifespan of your A/C unit and saves you money on utility bills. When A/C repair appointments become increasingly frequent or the unit doesn’t keep the home as cool as it once did, it’s probably time to consider a cooling system replacement. Whether your old system needs replacement or you are purchasing an A/C unit for a new home, we have the experience, knowledge, and tools for expert HVAC installations. We offer a number of residential cooling systems for you to choose from and can recommend a system that meets your home’s unique cooling needs for years of indoor comfort. The most effective way to extend the functional lifespan of any AC unit is by scheduling regular A/C maintenance. Bloomington Heating & Air provides residential customers with a Comfort Savings Plan Agreement to help them maximize the benefits of professional cooling system maintenance on their unit, including reduced frequency of system breakdowns, increased efficiency, and lower monthly utility bills. Members enjoy discounts on service repairs, and receive priority service status, among other exclusive benefits. If you're in need of an emergency A/C repair due to a refrigerant leak, mechanical issue, or another problem, Bloomington Heating & Air is on-call 24/7 to assist. We also offer routine air conditioning maintenance residents favor as a measure to prevent HVAC emergencies from occurring. But most of all, your home's air conditioner is part of an elaborate HVAC system that you only want to trust in the hands of professional technicians. Contact Bloomington Heating & Air today for all your A/C maintenance and repair needs.